Yesterday was my half birthday. Hooray! 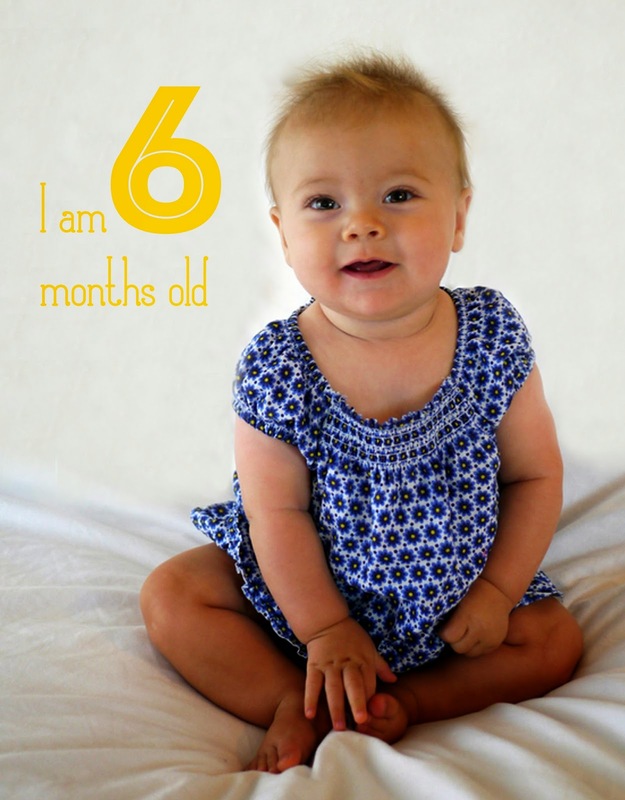 I'm six months old. I tried to ask Mummy for a half birthday party and half birthday cake but she didn't seem to understand what I was saying. I guess I'll have to wait until my actual birthday, six months from now. That'll give Mummy plenty of time to plan it! I've been pretty busy over the last month. Like always I've been learning all sorts of new things. My new favourite thing is eating. Mummy calls me P. Piggly Hogswine because I like to eat a lot! I'm already eating two meals a day (lunch and dinner) plus snacks throughout the day. My favourite foods are rice cereal, mushy fruit and veggies, yoghurt, pieces of banana, Baby Mum Mum rice crackers, and whatever Mummy eats at the Cheeseboard. Those brioches are pretty tasty. Oh, and I'd really like to eat some cake, but like I said before, Mummy doesn't seem to understand my requests. I also like trying to eat shoes. And Mummy's nose. I'm not sure if either of those things are actually edible though. My other new favourite thing is crawling. After a month of scooting around on my belly I've learned how to crawl properly. I still like my belly flop technique as I'm pretty fast at it, but each day I'm crawling more and more. Now that I'm moving around everywhere I'm getting into everything. Mummy keeps moving Ava and Lola's toys off the floor to stop me trying to eat them. I really need to get my little hands on their toys so I'm learning how to pull myself up on furniture. So far I can pull myself up to standing in my crib, in the bath and on the tv cabinet. I love taking a bath with my big sisters. I sit up with them like a big girl and splash my hands non-stop. Splashing Lola is especially fun! She hates getting water in her face so I make sure to splash her a lot. She screams and I laugh and laugh! I like to give high fives to Mummy, Daddy and my big sisters. It's so much fun, especially when I miss. Oh, that makes me laugh so much! At my recent check up the doctor told Mummy that I'm now pretty much right on average for my weight. I now weigh 7.13kgs (15lb 11oz) and I'm 66.5cm (26 1/4") long. Oh, and one more important thing... I'm now an Australian citizen just like the rest of my family. I don't understand what that means but I think it has something to do with kangaroos. Or emus. I'm not really sure, but they both appear on my citizenship certificate.